Various studies and surveys conducted over the past few years both in the US and European countries have revealed that a regular internet user has to remember anywhere between 5 to 20 passwords. Nowadays various social networks and other related services are launched every other day, so this count keeps on increasing. If you are avid Internet user you can have anywhere between 15-60 passwords. Even more if you are a blogger or early adopter, since they are the first ones to sign up for various services. That is just to name a few. If you are one of the people who has several passwords to remember , KeePass Password safe is just the tool for you. KeePass Password Safe is an open source project and has been around for a few years, so its perfectly trustworthy.Its free, lightweight and quite easy to use, even though it feels a bit too geeky at first. 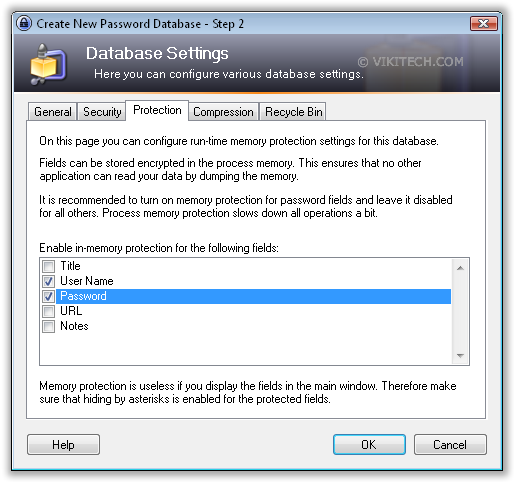 KeePass stores your passwords in the database it creates which is encrypted with AES or Twofish Algorithm (used by financial institutions to safeguard customer information). All you need to do is remember a single “Master” password that opens up this database. You can download KeePass from here. Once you download and install it you would first need to create a new database. Click on File in Menu bar and then “New”. It lets you select a location where you want to store the database. 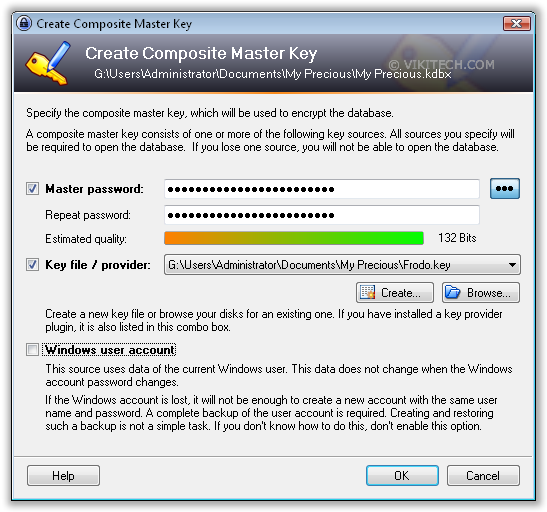 Once that is created KeePass gives you the option to create the master password to protect your database. Here you can select 3 different ways to protect your Passwords. The first option is to create a master password. The quality of the password is indicated by the indicator below which helps you judge the strength of your password. The second is the Key File. You can create a Key File which is needed every time you want to login to your database. The main advantage is, you can keep your key file in a different location than your password database. So even if somehow your master password is compromised, no one would be able to view your passwords without the Key File. 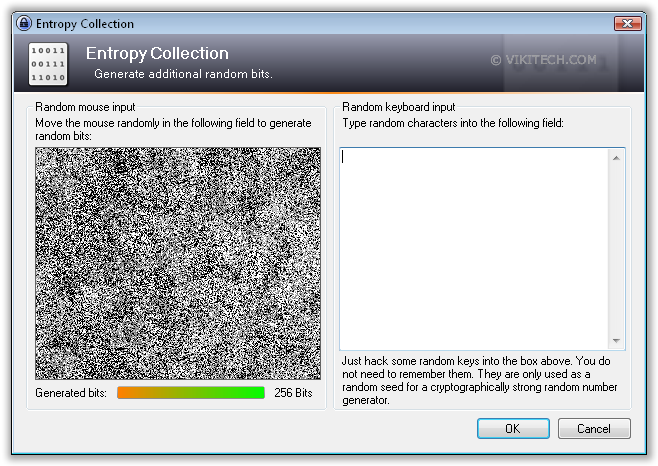 The Key File generator as shown below, generates the key file for you. Windows User Account password can be used if you need to login to your windows account every time you start Windows. This is the third authentication option to open a specific database. However its not recommended to use this, because if you reinstall windows, you wont be able to use the old profile password and you wont have access to your own passwords. The second step is to select a few setting for your database. You can select the options as you need them. The third tab labeled Protection has just one option selected – Passwords. This means that only your passwords would be kept encrypted in the computer memory when you are copying and pasting them in the browser. Its recommended that you select the username field as well. More the number of options that are selected the more memory is consumed during copying and pasting process. Once you have created the database you can start adding passwords to it. This can be a good time to change your regular passwords to more secure passwords using the KeePass Password generator. Many services have no password character limit, so you can create a really strong password with 20-30 characters all mixed with numbers and symbols. These are extremely tough to break. 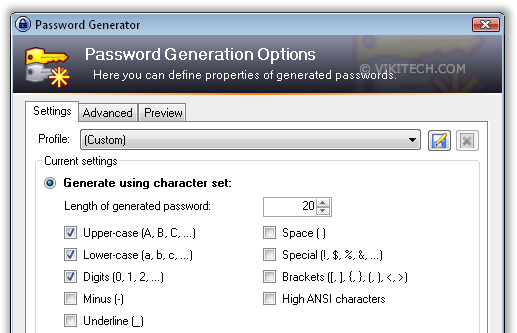 The generator also shows you the quality and strength of password in an indicator. It lets you select the type of characters that you would like to include in the password. The upper and lower case characters along with numbers should make an excellent password. 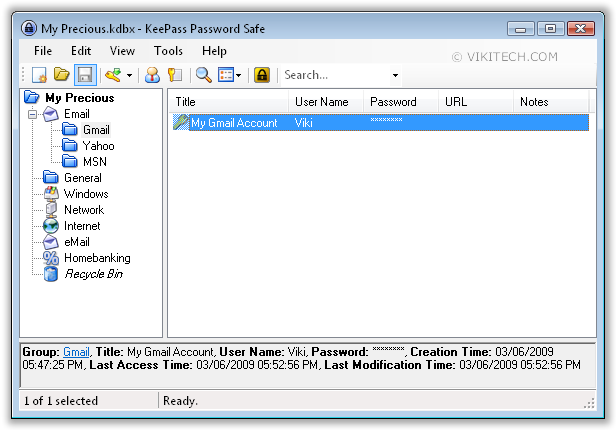 KeePass has an option to store passwords in groups like passwords for Emails can be kept separate from Social Networking passwords and so forth. You can also create sub-groups in a group. For e.g. : Gmail, Yahoo Mail, MSN can be subfolders in the Email group. This makes locating passwords very easy. You can specify keyboard shortcuts for KeePass in Tools > Options. Every time I need to login to an account I just Press Alt + P and KeePass pops up. I drag and Drop the Username and Passwords in the fields and login. 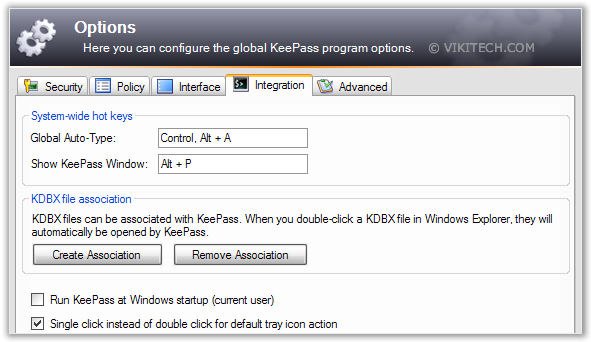 With the use of certain plugins, you can have a tighter integration of KeePass with your browser and also get the option to have your passwords auto filled. KeePass sports a number of features and is extendible like Firefox, with various plugins that have been created for it. It also has a number of inherent cool features. Drag and Drop Passwords and Usernames: You can keep KeePass open and when you need to login to a site, just drag your username and passwords to the respective fields and Login. KeePass is Portable: KeePass can also be installed as a Portable App on your USB drive so that you can have access to your passwords on the move. Import and Export Function: If you are using another Password Manager like LastPass or Firefox’s own password manager, you KeePass lets you import them easily from any other Password Manager in various formats like Text, XML, CSV, HTML etc. If needed you can export your passwords as well. Excellent Search Function: KeePass has a search function if you want to quickly locate any specific password. Time Fields: KeePass keeps a record of when passwords were created and changed. If you want you can keep an expiration time and KeePass would remind you that you need to change your password for specific account. This is an effective practice to keep your passwords safe. You can keep this setting for your important account. Intuitive and Secure Windows Clipboard Handling: Just double-click on any field of the password list to copy its value to the Windows clipboard. KeePass can clear the clipboard automatically some time after you’ve copied one of your passwords into it. Protection against clipboard monitors (other applications won’t get notifications that the clipboard content has been changed). All these features along with the advanced encryption Standard used by KeePass makes it the best free Password Manager available today. Give it a try if you need to manage a number of passwords everyday. It wont disappoint you! Let me know if I missed out on any features. Also if you have any other good password managers to suggest let everyone know in the comments section.